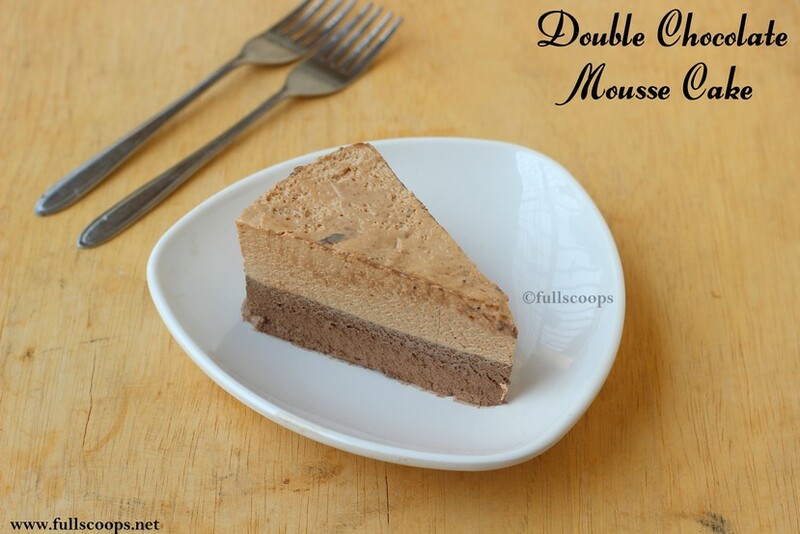 Double Chocolate Mousse Cake ~ Full Scoops - A food blog with easy,simple & tasty recipes! I made this delicious melt in the mouth mousse cake for my husband's birthday this year and we totally loved it! 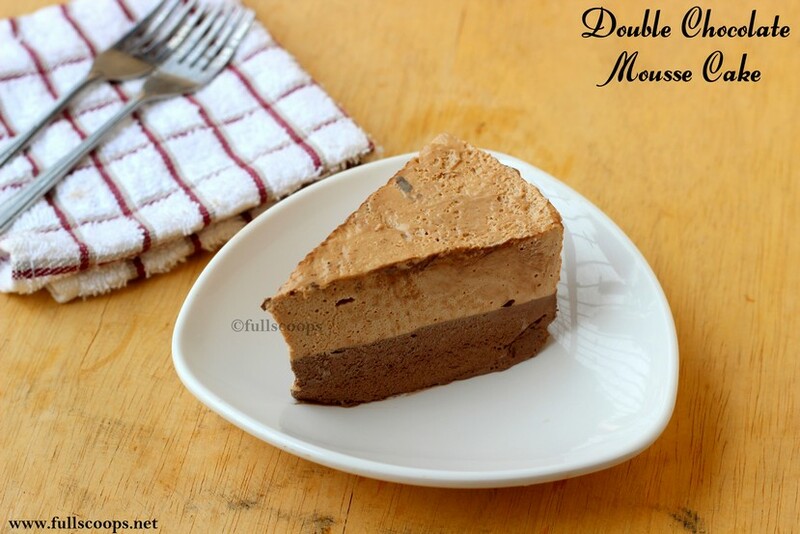 The dark chocolate and milk chocolate combination balances very well to give the perfect flavor and taste to this cake. 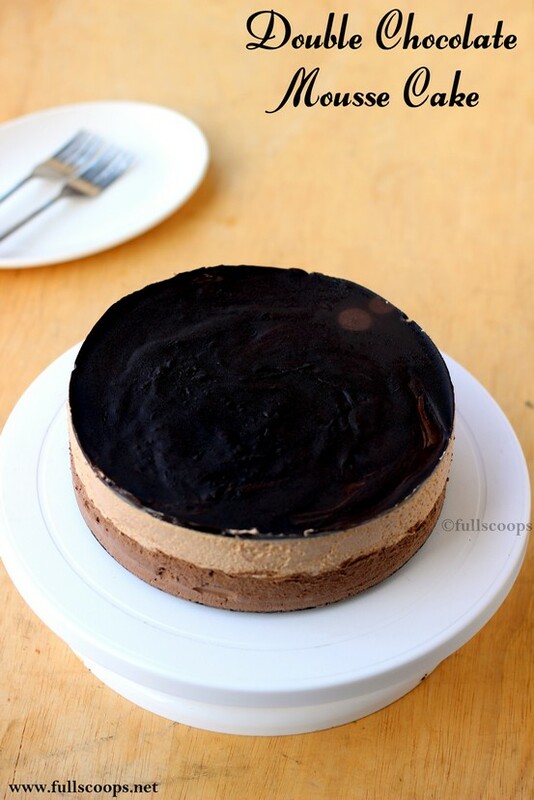 The mistake I made with this cake is that, I added a layer of melted chocolate on top which set hard and made it extremely difficult to cut the cake. Outside of that, this cake was perfectly divine! 1. Grease an 8 inch springform pan and set aside. 1. Take the chocolate and fresh cream in a microwave safe bowl. add the instant coffee powder and heat it for 30 seconds, mix well and heat again for 30 seconds. 2. Mix till it is smooth and homogeneous. Set this aside to cool. 3. Take 2 tbsp of water in a microwave safe bowl and sprinkle the gelatin over it. Let it sit for 5 minutes to bloom. 4. After 5 minutes, heat the gelatin in the microwave for 30 seconds. It will become a clear solution. Let this cool slightly. 5. Take the heavy whipping cream in a large bowl and add the vanilla to it. Beat the cream until soft peaks are formed. 6. Now add the cooled gelatin to the cream and beat again until stiff peaks are formed. 7. Add the cooled dark chocolate ganache and beat until incorporated. 8. Pour this into the greased pan and tap lightly. 9. Refrigerate until we prepare the next layer. 1. Take the chocolate and fresh cream in a microwave safe bowl and heat it for 30 seconds, mix well and heat again for 30 seconds. 7. Add the cooled milk chocolate ganache and beat until incorporated. 8. Remove the pan from the refrigerator and pour this milk chocolate mousse over the dark chocolate mousse and and tap lightly. 9. Cover and refrigerate for 4 hours. When removing, the cake out and let it sit for a few minutes then gently release the pan and remove the ring. 1. I have added a layer of melted chocolate but please do not add that layer. 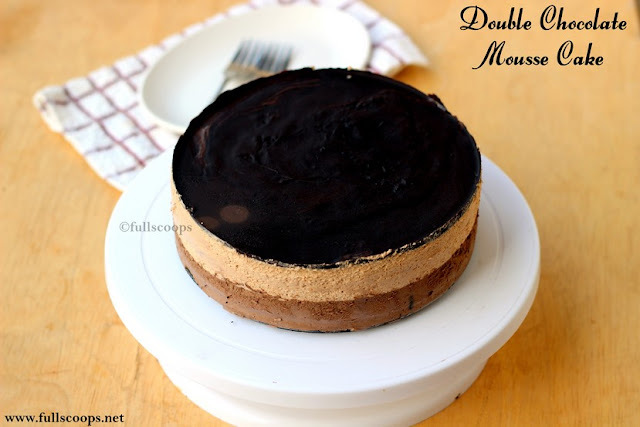 It gets very difficult to cut the mousse cake as the layer of chocolate sets hard. Instead you can add chocolate sauce or sprinkle some cocoa powder. 2. Instead of the microwave, you can also use a double boiler to melt the chocolate.